Casino Jack and the United States of Money (Director: Alex Gibney): If you like your political intrigue mired in the cesspool of corruption and governmental incompetence then look no further than Casino Jack and the United States of Money, the latest documentary from director Alex Gibney (Enron: The Smartest Guys in the Room and Taxi to the Dark Side). 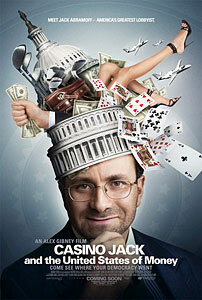 Casino Jack… examines the rise and fall of Jack Abramoff, the Washington super-lobbyist who is now finishing up a four-year prison sentence after being convicted of tax evasion, fraud, and conspiracy charges. Abramoff and his crooked dealings are the focus, but Gibney also takes a peripheral view of the strange world of high-powered lobbying. The film lays out a fairly dense landscape of quickly-paced political facts and figures, with a whirlwind of interviews involving former Abramoff associates, outsiders, and journalists who exposed his abuses of power. The central figure himself is conspicuously absent (for the most part), aside from the numerous archival clips and photographs shown. Extensive interviews with Abramoff were, in fact, conducted for the film, but prison rules prohibited him from being recorded. The film doesn’t suffer greatly from his relative absence, and his side of things is provided through a voice-over from actor Stanley Tucci (actor Paul Rudd also contributes a voice-over for Michael Scanlon, a former Abramoff associate). Abramoff is a very colourful character – it’s no surprise to learn that a feature film about him is due later this year, starring Kevin Spacey. The title being used, Casino Jack, has become a matter of dispute between its filmmakers and Gibney. At age 12, after watching Fiddler on the Roof, Abramoff converted to Orthodox Judaism. Later years saw him obtain a law degree, become chairman of the radical College Republican National Committee (a group of “free market extremists” united by the Reagan Revolution that also included future Republican heavyweights Karl Rove, Grover Norquist, and Ralph Reed, who espoused belief in minimal government and unregulated capitalism), and eventual ascension to right-hand man to prominent Republican and one-time House Majority Leader Tom DeLay. DeLay, after his own fall from grace, could most recently be seen eviscerating what little remained of his reputation by appearing on “Dancing With The Stars”. Abramoff’s political career arc is interrupted by a ten-year stint as a Hollywood writer and producer – his most, uh, noteworthy credit is Red Scorpion, the schlocky 1989 Dolph Lundgren vehicle. His Hollywood past is humourously alluded to in an email shown at the beginning of Casino Jack…, where Abramoff writes to Gibney, “No one watches documentaries. You should make an action movie!”. The lobbyist’s downfall is carefully dissected, providing an impressive examination into Abramoff’s biggest blunder: the systematic bilking of American Indian tribes who got into the casino business and needed his influence-peddling to sustain their operations. Incriminating emails point to the callous greed at the heart of his motivation, including one where he laughs at their obliviousness to his fraudulent billings by stating “stupid people get wiped out”. Other morally dubious political dealings involve Abramoff’s lobbying on behalf of sweatshop owners in the Northern Marianas Islands (a US territory), a misguided attempt to convert the islands into a land of flourishing capitalism, and a shady business deal involving a floating casino operation known as SunCruz Casinos that involved the former owner being murdered. Abramoff’s ability to carry on the way he did, for as long as he did, is perfectly summed up by a quote from a former disgraced associate: “Jack Abramoff could sweet-talk a dog off a meat truck”. It can be a challenge to absorb everything coming at you and not be overwhelmed by the story’s wide scope, especially with a running time of two hours. Gibney wisely inserts some clever graphics, film clips (including Mr. Smith Goes to Washington and Patton), and recognizable songs (including “Enter Sandman”, “Watching The Detectives”, and “Burning Down The House”) to dilute all of the heavy politi-speak hitting the viewer and alleviate the oppressive seriousness of the film’s subject matter. Getting through Casino Jack… may be daunting for some, but it is a sobering eye-opener into the world of lobbying and the profound influence it has on American politics. This entry was posted in Documentaries, Film Festivals, Hot Docs and tagged #hotdocs10, corruption, politics. Bookmark the permalink. Correct me if I’m wrong but the 7/10 that you gave this film is the highest rating for any film you reviewed at Hot Docs this year. I missed it at the festival but I’ll have to look for it later in the year. I just gave the Rush doc a 9 out of 10 and my upcoming reviews of ’12th & Delaware’ and the Joan Rivers doc will get an 8 and 7 out of 10 respectively.